As you may or may not know we will be adding more clans to the current amount of clans later on. The first two clans to join will be Twilightclan and Dawnclamn. So here is my leader cat for Dawnclan! Daystar-Long furred creamy black and gold tom with fur that sticks out. He has golden green eyes and a long tail. He is just, smart, even tempered and fair. He used to be the loner known as Day before he joined the new growing clan of Dawnclan. He was a perfect candiate for leader so it was no surprise to the other cats execpt him that he was chosen as leader. His biggest rival in being leader happened to be his brother, Polarshadow who was slightly more mean, strict, and harsher then he was. When Daystar was made leader Polarshadow was angry that he was not the leader because he had tried very hard to be the leader. Spiritclan instead made him deputy which he is conetent with. When Day was a loner he mated with a rogue named Sunny. They mated and had kits:Aurora and Glaze. Sunny died when she was giving birth as no could help her when she was kitting. The kits survived, luckily. Even though Sunny died before she joined the clan she was accepted into Spiritclan and is now known as Sunspirit. Daystar beleives he owes a great debt to Autumnsatr who helped found the clan becuase without her making the clan his kits surely would have died! Her is fair with punishments and spends any free time he has with his kits, Aurorakit and Glazekit. cool cat. jw, when would this happen? Oceanstorm wrote: As you may or may not know we will be adding more clans to the current amount of clans later on. The first two clans to join will be Twilightclan and Dawnclamn. So here is my leader cat for Dawnclan! What is the Dawnclan personality? I am not sure yet I just posted him so the position would not be taken. I was fretting about it all day that day! I made answered some questions so like check em out! And I posted on the other website topic on NW. Night Whispers. How about she will be the leader of Rainclan? 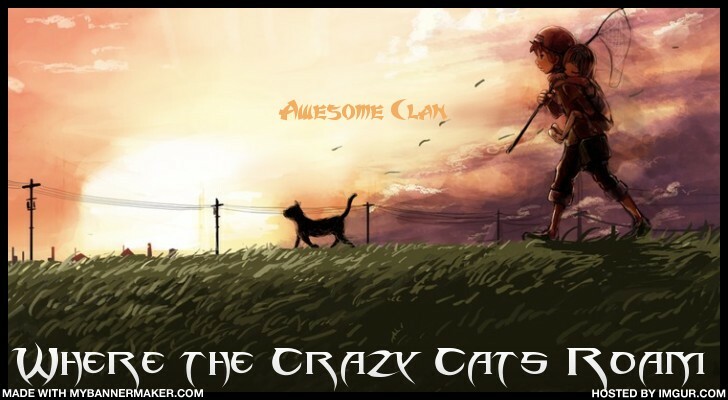 That is the clan that is coming in after Snowclan, which is coming in after Dawnclan and Twilightclan. Also the leader of Twilightclan is Navystar. k illl b rainclans leader CALLeD IT no 1 else can call it now!!!!!!! MUAHHAHHAHAHAHA!!!!!!!!!!!!!! uno questiono if im leader can i choose stuf about it????????????????? cuz i wanna choose stuffs about it PLZ PLZ PLZ PLZ PLZ plz pLZ PZLPZLPZLZPZLZPZLPZLZP PZL P:LZ!!!!!!!!!!!!!!!!!!!!!!!!!!!!!!!!! PPPPPPPPPPPPPPPPPPPPPLLLLLLLLLLLLLLLLLLLLLLLLLLLZZZZZZZZZZZZZZZZZZZZZZZZZZZZZZZZZ!!!!!!!!!!!!!!!!!!!!!!!!!!!!!!!!!!!!!!!!!!!!!!!!!!!!!!!!!!!!!!!!!!!!!!!!!!!!!!!!!!!!!!!! ill make a new clan that i will b the leader!!!!!!!!!!!!!!!!!!!!!!!! I guess but we already have 9 clans so I think 10 will be WAY too many. Tiger will be the evil leader first of Rainclan-then he or she will die and then Hazey will be leader! ya Tigers got a point im not evil im making a clan and dont try to change my mind i wanna make a clan and i WILL!!!!!!!!!!!!!!!!! Ou are too new and you don't know all of the rules yet, once you rp properly then we might let you name a clan. If the rp is succesful then we will add another clan. If we do add something it could be a tribe. But for that to happen you will have to be patient and rp until all the clans have appeared. Snowclan-After Dawn and Twiligh settle in, Loud will get another prophecy and will with Mittens, Tempest and Jubilee journey around the islands to learn about Snowclan and then they will make it. i have 3 letters 4 u Y-E-S spell it out----- YES!!!!!!!!!!!!!!!!!! Not only are planning ahead WAY too far, but OCEAN: CHECK YOUR PM!!!!!!!!!! Propserity is a cool WORD! "Also if you want Hazey to be the leader of Rain, then you can-just pm how you want it to play out (EX. Hazey kills the leader and ends the war and disbands the clan or whatnot)"
But then again we have to remeber that Firestar killed cats and he is not a murderer and I am sure if there was a tyrantial leader inn charge of your clan you would try to your hardest to him bad. It wouldn't be bad and considered a murder if you killed a EVIL leader. Beside you would be a better leader then the evil one and would lead the clan into happy, peaceful times of prosperity. I don't think that's a very good idea! Wetfoot PLEASE be reasonable. I'm getting very irritated just by looking at your conversation! It is a bad idea to let Webfoot be a leader. If anything,she should get a warning to not be trolling,we shouldn't give her what she wants. She has broken all your rules,and she goes unpunished. It would be horrible to give her what she wants. How did wetfoot break the rules? Didn't know we had rules!! Anyway, I am all for making a new clan. It is a great idea!! We should choose one and make 10 clans!! I like swampclan a lot. If we do i wanna be the medicine cat!!!! Icedragon wrote: How did wetfoot break the rules? Didn't know we had rules!! Anyway, I am all for making a new clan. It is a great idea!! If I didn't know that you joked a lot,I would swear you were crazy. However,of course I know you aren't serious. Jetways my suggestions and I have for at least 4 years. 1) Wetfoot, you can't be leader. No offense meant, but you really aren't good at rping yet, you are just too new. 2) no more than 5 clans at a time, we already have trouble populating them. 3) authority should be given tooth people that do the most for this website, it doesn't matter who you know. Okay? I'm not bossing anyone around, these are just my experienced findings. Agreed. Wetfoot, you should rp more and learn about the rules more and not make your own clan when we say you can't be leader. Gain some experience and then maybe we will see if you are ready for some higher positions of power.